When it comes to beautiful, high-quality porcelain, no name is more renowned than Pillivuyt. Established in 1818, the Pillivuyt porcelain house has been designing and producing magnificent porcelain in the heart of France for almost two hundred years. Each piece in their collection is expertly crafted, featuring a pure white, diamond-hard glaze that is embedded through the piece rather than being applied to the surface, to create exceptionally strong porcelain with a gorgeously glossy finish. But Pillivuyt porcelain is not only beautiful – it is also designed to last. With advanced thermal shock resistance that allows it to be transferred directly from freezer to oven, it offers superior heat retention and is also resistant to scratching and chipping. Perfectly uniting centuries-old master craftsmanship techniques with modern technological advances, Pillivuyt is outstanding in every regard. Try Pillivuyt and experience the difference yourself. A pure white, diamond-hard glaze is embedded throughout each piece rather than applied to the surface. The result is glossy and strong porcelain designed to last. Thermal shock resistant – withstands temperatures between -25°C and 300°C, and can be transferred directly from freezer to oven or microwave. Resistant to scratching and chipping. Hygienic and easy to clean – non-porous glaze won’t absorb bacteria, tastes or odours. Freezer, microwave and oven safe. 4 x Entree Plates - 24cm. 4 x Dinner Plates - 28cm. 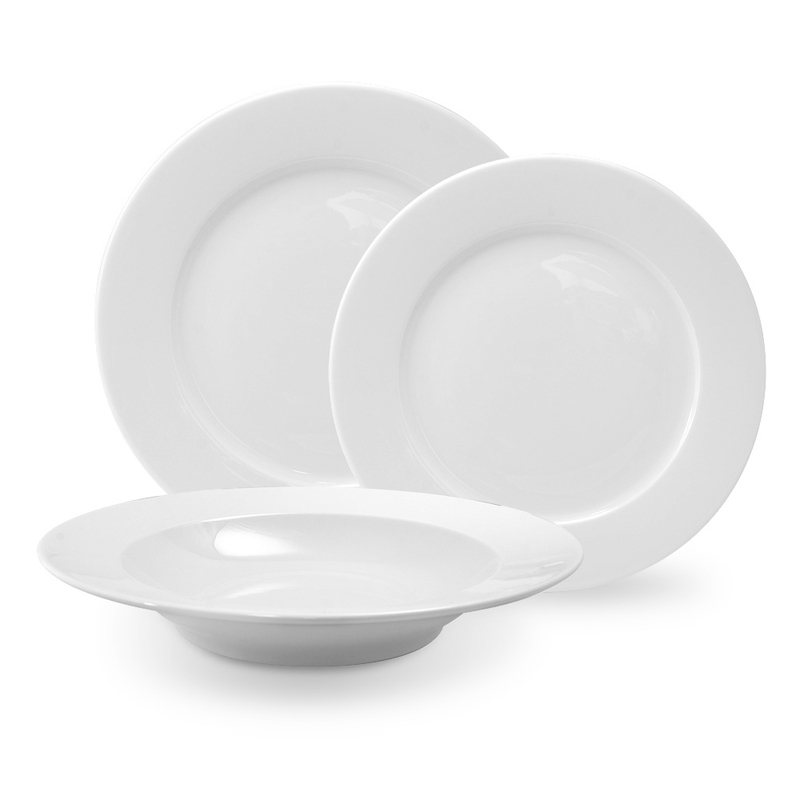 4 x Rimmed Deep Dishes - 28cm.